Student research papers should be single-authored and describe preliminary results and future directions of the student's on-going research. The papers will be reviewed by a committee led by the Student Forum Chair. Accepted contributions will be published in the Supplement of the 2006 International Conference on Dependable Systems and Networks. Papers should be no more than three pages long (IEEE double-column format), and should be submitted in camera-ready form, ready to be printed. There is no revision cycle. Contributions should be submitted as a Portable Document Format (.pdf) file to the Student Forum submission page. The criteria for acceptance of Student Research Papers will be originality, relevance and interest to the community. You will be notified by April 28, 2006. The final submission deadline is April 1, 2006, but you are encouraged to send in your submission well in advance of the final deadline. Late submissions will not be accepted. By submitting a Student Research Paper you are committing yourself to present it at the conference if it is accepted. 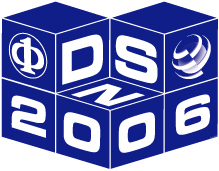 The IEEE Computer Society Technical Committee on Fault-Tolerant Computing will solicit applications for travel scholarships to partially offset the cost of students planning to attend DSN-2006 in Philadelphia, USA, June 25-June 28, 2006. To be eligible, the applicant must be enrolled in a degree program at the time of DSN-2006. Authors of accepted papers, students submitting papers to the Student Forum, and others are all welcome to apply. Participation, such as presenting a regular paper or a paper in the Student Forum will be used as one criterion in awarding the scholarships, however. The Technical Committee anticipates awarding scholarships in the range of $500. To apply, submit a write-up not exceeding 500 words stating your student status and summarizing your current research related to dependable computing and describing how it is relevant to DSN-2006, what you hope to learn by attending the conference, and how you expect it to affect your future research directions. Which DSN venue, if any, did you submit (PDS, DCCS, which workshop, student forum, fast abstracts)? Who is your thesis advisor?